Eveline Novakovic (née Fischer and credited as such in her Mario-relevant works) is a British video game music composer and sound engineer employed by Rareware. 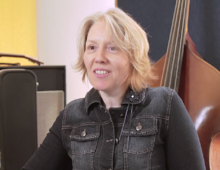 Her first work was composing part of the Donkey Kong Country soundtrack, most of which was composed by David Wise. She later composed the majority of Donkey Kong Country 3: Dixie Kong's Double Trouble! and its pseudo-sequel Donkey Kong Land III, though the former soundtrack was replaced for the game's Game Boy Advance port. Novakovic also portrayed Pipsy in Diddy Kong Racing, Tiny Kong in Donkey Kong 64, and Dixie Kong in the Game Boy Advance version of Donkey Kong Country 2 and Donkey Kong Country 3. The latter two roles were eventually taken over by Kahoru Sasajima. In addition to her work in the Donkey Kong series, she has contributed to other Rareware productions, such as voicing Joanna Dark, the protagonist of Perfect Dark. This page was last edited on October 6, 2018, at 16:22.